So I'm totally excited to link up with the lovely Grace to share my birth stories. I figure I'll start with Emeric since it's all fresh in my mind. *************WARNING, ESPECIALLY TO ANY MALE FAMILY MEMBERS WHO MAY BE READING...you probably just want to stop here. October 30th 2012 - 36 weeks pregnant with Emeric, bambino #3. 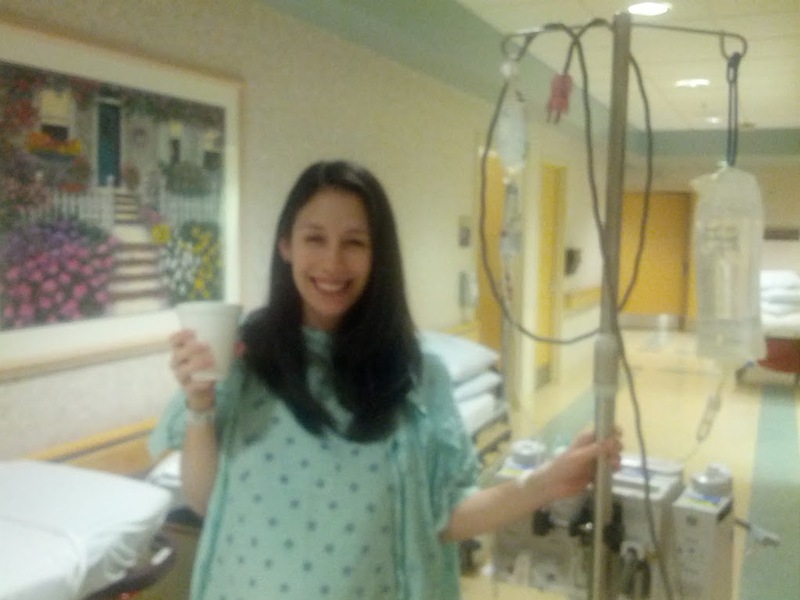 I'm having sort of painful contractions again, which has been happening on and off this pregnancy but is not something that I ever experienced with my girls until it was < 3 hours until baby time. The pain is easy to deal with, but since the girls were extremely hasty in making their entrance into the world, it makes me nervous. I've already been to the hospital twice with fits of contractions coming every 2-3 minutes - once at 30 weeks when we were in Outer Banks. At 34 weeks I had a fetal fibronectin test which was negative. It's the morning after hurricane Sandy rolled over us, but remarkably it was completely anticlimactic in our Baltimore suburb. Still, I have no idea what roads may be closed on the way to the hospital due to downed trees or flooding, so late that afternoon when I experience a little gush of blood and possibly fluid I decide I should go to the hospital ASAP just in case it takes us a while to get there. My awesome sisters had been staying with us to help out with the girls, so Stephen and I were able to just head right out the door. I try calling L&D on the way, but nobody called back. We checked in at the ER and I was wheeled upstairs and I saw my FAV midwife Janine who delivered Ava sitting at the phone muttering about the huge list of people who had called while she was in her last delivery. Apparently the hurricane + full moon that had just happened was sending L&D into spasmodics. As I wait for Janine in triage, I'm having serious doubts - my contractions are only coming every 5 minutes or so and most of them aren't even painful. But Janine checks me and proclaims I'm 5cm dilated so I'm staying! After 45 minutes of laps it was time for 15 minutes of monitor time, which was fine with me - I was getting pretty sleepy. I got into my hospital bed and was excited to see I was in time to catch the new Covert Affairs. After they had finished with the monitors, the nurse got me a birthing ball to roll around on for a bit and told me to call when I started to feel pressure. I sat for a few more minutes and by this time the contractions were picking up. I was still feeling pretty sleepy though, so I got back in bed. I rest for a while, just waiting for that "it feels good to bear down but it's not time to push yet" feeling. 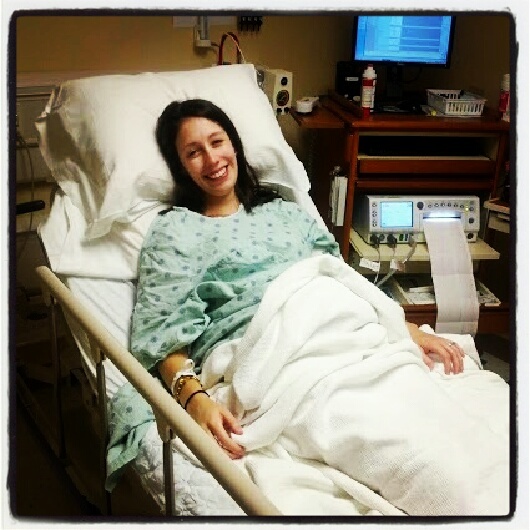 Contractions were strong, but still only coming every 5 minutes so I felt like I had a ton of recovery time in between. Finally I had a contraction that felt a little different...I was pretty sure this was it, but gave it another contraction just to be sure - yep, I was definitely bearing down. I asked Stephen to call the nurse. Hahaha I definitely wouldn't call my deliveries normal!! And believe me, I'm glad they're not!!! This reminds me that I really need to write up my birth stories too... Well, the twins are fresh in my mind, maybe I'll do that tonight! But truly, I definitely had somebody looking out for me...I found out later that while I was delivering him, all doctors were currently in the OR - so if there were any trouble getting him out and I needed an emergency c-section , it would have been a very serious situation. Add to that the fact that neither my midwife or the nurse had ever delivered a breech baby before!!! But yes, I wonder if I have another breech baby in the future if they would allow me to try to deliver normally...and yes, please write your birth story!!! Now that I think of it, I'm not sure I've ever read a twin story that wasn't a section!! Amazing! I assumed footling, that's a little easier right? But hey, you gave the midwife & nurse experience delivering a breech baby, so maybe they'll be more open to the possibility in the future? Good thing he was small! http://www.youtube.com/watch?v=PRZ47zdEAzo - according to the midwife this was what he was like coming out!! Soooo glad he was small!!!! oh my goodness, this is incredible!!! coolest birth story i've read so far, for sure. Thanks Ana!! I was totally thinking about you after this happened...I had just read your story about Bernadette and it made me shudder to think about what would have happened if he was wedged in there the way she was...and I was VERY glad to hear Lucy came out head first, that means there's hope to avoid this situation with future babies!!! I'm here from Ana's and wow wow wow. UnbeLIEVable. So happy it all went well - I'm so curious now to find out how often babies are accidentally delivered breach. And you make birth sound (and look) kind of...like a picnic. I am curious too...I mentioned in a comment above that my nurse and midwife had NEVER delivered a breech before, and another midwife told me she only had one in her entire career so far...I'm sure it was much more common before ultrasounds were invented!! Several people had felt my belly and nobody picked up on it...and no ultrasound while in L&D, I'm guessing because it was so busy that night. Btw I subscribed to your blog recently and am loving it - so glad you stopped by!! Oh I'm so glad you're here reading this too!! I really haven't read much at all in terms of medical risks about delivering breech, but my delivery went so smoothly and I've love if more women were able to do this and avoid the c-section when it's possible...the more people on board in the medical community the better!! I'm also here from Ana and amazed! My third was confirmed to be breech at 37 weeks (for a few visits prior the midwife just wasn't sure) and I hunted high and low for a doctor that might let me try to deliver him breech if he didn't turn. No such luck. But thankfully I found an OB who would do a version and attempt to flip him while still in utero, which worked. Funny thing was, I was having contractions like crazy when he was breech, and then we got him flipped and they all stopped and he was almost a week overdue. I suspect that his positioning had a lot to do with all of the contractions I was having from about 30 weeks on--more pressure on the cervix? Then, when it was just his head instead of his bottom/back, nothing... Anyway, I'm so glad everything went so well for you! I'm loving hearing everyone's breech info!!! 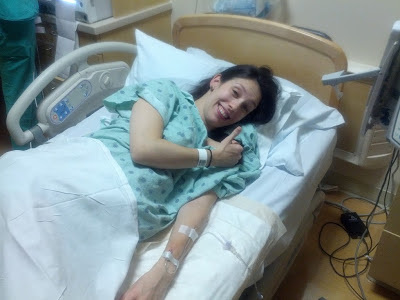 I seriously never even thought or learned anything about this until this happened...VERY interesting that the contractions stopped after your baby turned - I had plenty of braxton hicks with my girls but never painful contractions before real labor like I did this time around. I definitely think there's something to that. (And that gives me hope for making it to full term next time around...) And glad to hear about a successful version, I'd definitely try that before trying to deliver breech again!! Thank you!! I need to get crackin' on the other two!! That is so fun! I'm glad your surprise breech went so smoothly. Thanks for sharing, and what a doll of a baby! The more I think about it, the more I think this was actually my easiest delivery. Crazy, right?! Congratulations on the birth of your newest sweet little one! Thank you!!! And best of luck on your upcoming delivery!! Jamie, you superwoman, I LOVE that you delivered breech! I'm so sick of hearing about c-sections happening left and right and you make me so happy! I can't believe they didn't catch that he was breech. You are so incredibly lucky in that regard! I'm 36 hours away from an induction for twins and on a birth story binge at the moment. Found your blog through Grace's linkup. I'll be back! Lovely blog! WHOA! Breech and they didn't know it!?!? So blessed that it went that well. And he's adorable too! 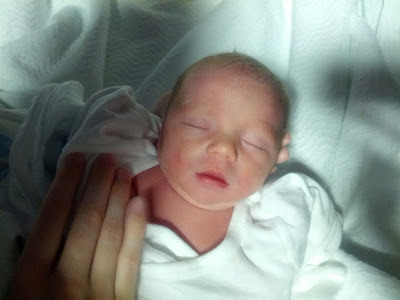 Okay, now I think you may have me beat for great birth stories.